Galaxy Painting: Turn Your Room into a Night Sky! He is the owner of premend services. If you require any kind of doorstep services at your home or office, then you can hire the professionals from them. Do You Want Some Internal Changes in Your House? Are You Tired of Seeing the Plain Wall of Your House? Yes, you always want some changes in the room like its painting, furniture, etc. Among them, wall painting is one of the most common things that you want to change at regular intervals. It adds a feeling of freshness and newness into your house. Therefore, add some fun colours or fun themes to painting your rooms. Nowadays, colours such as white and ivory have become so routine and monotonous that you need a change in theme for your house. One such way to make your room exciting is by painting your room like a galaxy! Yes, you read it right. 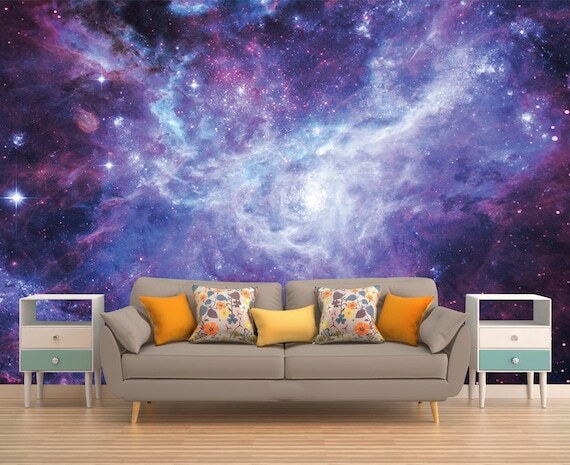 Galaxy painting creates some unique design or pattern on your wall. It is a galaxy themed paint in which the galaxy type drawing is painted on the wall. This painting is also known as night sky painting. You will love this theme so much that you will think this is the best suited for your room and also your kids. For galaxy wall paint, you can decide what kind of mural you want to paint and on which wall/walls you want to have the galaxy theme. There are plenty of galaxy theme images available on the internet that will help you in deciding as well as give you different ideas. To start the galaxy painting, you can select any dark shade or a dark colour for your background. Make sure that the walls are primed well before you start galaxy theme You can also white wash the walls and then start the painting process. Choose colours like indigo, dark blue, hues of purple, etc. You can also mix some colours of darker shades while painting the wall. First, go with a darker shade of the blue or indigo shade on the wall and then add other shades such as lilac, green, red, etc. to make it more presentable for the theme. You can also add white and yellow colours at the bottom part to give it a surreal look. Adding bright colours will help you in creating a theme that completely represents the galaxy. Also, you can spray paints as it is less time consuming and quite easy to work with. You may use regular paints too but make sure let them dry completely before starting anything else on that wall. Note: You can also take black as a background colour and then add other colours to make it look more attractive. You can search for images on internet and start drawing the projections on the wall using chalk. You can draw things like spaceships, asteroids, planets, comets, etc. whatever you find attractive for your wall and appealing to your heart. Draw it with chalk first and see if it looks according to your expectations. Once you finalize the drawing, you can fill the drawings with white colour as it will look beautiful on the dark background. Make sure you are painting the objects with the proper brush and precision. You can create some unique picture by drawing constellation on the For that, you can search an image of the constellation as per your zodiac sign or any constellation drawing that you find perfect for your galaxy theme. Then start to draw the constellation with the chalk on the wall. Once you finalize the drawing, fill the dots with the white colour and darken other spots that you think need some retouching. Drawing constellation is pretty easy as you have to place dots in part of your painted wall and voila (there it is), a constellation on the wall. Make sure that you don’t take up the entire space while depicting a constellation, leave room for some more fun things! Also Read: How does Human Eye Perceive the Colour? Now draw the galaxies, stars and a nebula with the help of the image with the chalk on the wall. This is the most critical step of the entire procedure as it gives the final look of the galaxy wall paint. Once you draw, you may also draw some gas clouds and place some dots overall to fill in the empty spaces. You can also use a toothbrush to create dots in the empty spaces. For colouring these drawings, you can use colours like blue, red and green as it will lift the entire painting. You can also use fluorescent colours so that it glows in the night and give you a feeling of sleeping around stars. This night sky painting colours are readily available in the market and online also. Be creative and add other fun colours to your paint and finish it up by doing the final touchings to your wall painting. Also, you can do galaxy painting on your ceiling instead of a wall which will also look beautiful flavours to your room. Make sure you have all the supplies and the images that are required for night sky painting or galaxy painting handy before you start the painting process. Having a galaxy painting on your wall could be something to make your kids feel cozy when you read bedtime stories to them. Enjoy your galaxy painting! It is a perfect way to decorate your home. And feel stars in your room! Previous PostPrevious Acrylic Finish VS Laminate Finish: Select the Best for your Kitchen Cabinets!! !